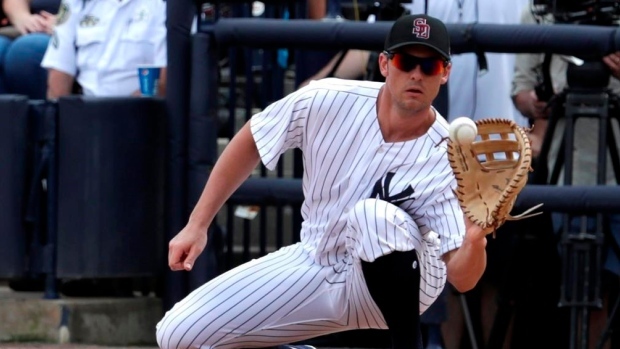 JUPITER, Fla. — New York manager Aaron Boone sent Greg Bird back to the Yankees complex in Tampa on Thursday after the first baseman developed stiffness in the elbow hit by a pitch a day earlier. "He probably could have played," Boone said. "It was me saying, 'Go home.'" Throughout the spring he's battled Luke Voit for the starting first baseman job, hitting .333 with three homers in 51 plate appearances. Voit has four homers while hitting .316 in Grapefruit League play. The Yankees will have more time than originally expected to make that decision. With centre fielder Aaron Hicks expected to open the season on the injured list with a back injury, there's room for both Bird and Voit on the opening day roster. New York also expects to get its first look at newly signed pitcher Gio Gonzalez in game action before leaving Florida on Sunday, but Boone isn't certain whether it will be in a Grapefruit League or minor league game. "Right now I think we're tentatively counting on him pitching Saturday somewhere and we'll start kind of evaluating where he is," Boone said.